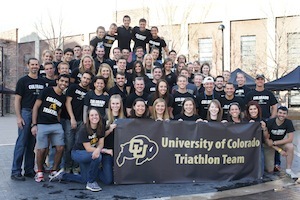 The University of Colorado, Boulder has shown itself to be a collegiate triathlon powerhouse. A few weeks ago, CU won their fourth consecutive national championship (2010, 2011, 2012 and 2013) at USAT Collegiate Nationals in Tempe, AZ; their 15th national champion title overall. At the helm of this seemingly unbeatable team is head coach Mike Ricci, owner and founder of D3 Multisport and head coach of the CU Triathlon team since November of 2008. 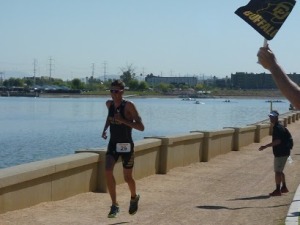 TrainingPeaks caught up with Mike at USAT Nationals in April to pick his brain for the recipe to his “secret sauce”, and see what all triathlon teams can learn from the 2013 National Champions and their coach. TrainingPeaks: Let’s lay the groundwork first – how did you get into coaching triathlon? Mike Ricci: I started racing triathlons in 1988 and started coaching swimming in 1989. I coached my first triathlete in 1992 or so. I was self coached as well for quite some time. I figured out a lot along the way, but read everything I could and listened to anyone and everyone on how to improve. I’ve tried just about every idea that’s out there on myself first and then on my athletes if I thought it was worthwhile. I started D3 Multisport in 2000, and have coached quite a few Ironman Finishers, Kona qualifiers, AG Nationals Qualifiers, Age Group Worlds qualifiers, XTERRA Worlds qualifiers and so on. All distances, all levels. Then I started with the team in November 2008. TP: Going back in time to November 2008 when you took over the team, what was the “State of the Union”, so to speak? How was the team in terms of talent, how it was being managed and coached, and what did you change when you took over? Mike: My first year was 2008-2009, and we had plenty of talent but needed to hit the reset button on the work ethic. The previous coach had just been let go and the focus had seemed to be on the Elite athletes on the team, and not the development of the team, which I think was a mistake. I created a system where the requirements were the same for every person on the team. I challenged the athletes to work hard and to see what would happen. They probably thought I was a little crazy at first since the atmosphere was pretty loosey goosey leading up to my arrival, but I put the pressure on them to be their best. I asked them to give the team their best, and I would give them my best. Instead of losing students who I didn’t think could cut it, they stepped up and made an impact. The two major changes I made was that people on the team had to come to practice a few times a week and there were was only one coach and one training plan while we were in CU’s season (September through April). We lost some fast people the first year, but I was willing to take a step back for long term success. I thought we had enough talent to win by 2011. That would have been 2.5 years since I started. Instead we won our first title in about 18 months. Make no mistake, CU will always have talent. They always have in the past and they will in the future. Being a real team is what makes this team different. Everyone has to put in the same amount of volunteer hours and no one is special. If someone thinks they are more important than the team, they usually aren’t a right fit for our team. We don’t stress winning ever. You can ask my team how often I bring up the words “win” during the year. I don’t. It’s not about that. Rather it’s about teaching these student-athletes about contributing to something greater than themselves; working with others to achieve a common goal. TP: If you could pick 3 things that you think you guys are doing differently from the competition, what would they be? Mike: One, every workout has a purpose – we use TrainingPeaks for our team calendar and we have specific paces / HR / RPE for each swim, bike and run. Two, we check in with our athletes often – we see them at practice so we know what their mood is, how they are looking, who is tired, who is dragging through a workout and so on. Three, the team is student-run and the big decisions are made by the students, for the students. The officers on this team learn about leadership and taking responsibility. TP: Let’s talk about the role of technology in your coaching of the team. How is CU using technology to get a leg up on the competition? Before the use of devices and training software, what were the tools you had to use and what difference has technology made in mentoring your championship team? Mike: Great question! We use TrainingPeaks for our team calendar and then each athlete on our team has the opportunity to create a free account at TrainingPeaks as well (as does anyone who is reading this article)! Being able to log your training, look at graphs, see average HR’s for certain runs and rides vs. the same workouts in the past, is a great tool. We have quite a few members of our team who use Garmin for the pace, elevation gained, and distance features. I am working hard to get them to use the heart rate function too. We have only a few athletes who have power, and those athletes usually maximize the bike and run to the best of their ability. In other words, having the power data allows them to execute a great race day plan. Eventually, it would be great to have more of our athletes using power and heart rate. Before the technology was so accessible, I would have to explain how to use RPE (rate of perceived exertion) to our athletes. It’s hard for everyone to understand their own RPE, but taking a watch with GPS and using pace, while matching that to RPE has made training in the right zones, easier. I use a few pace charts for the team and we base our key run workouts off those charts. Honestly, I think there’s a lot we can get better at just by educating our team on the use of technology; specifically, pacing, heart rate, and power. TP: What about the benefit of being based out of the endurance sports mecca of Boulder – whether it’s the altitude, the community, or the ease and convenience of training? What would you recommend to a team that might not be located somewhere so bike- and run- friendly as far as getting their training in? Mike: I think the altitude is an advantage but we have to be careful about our athletes getting run down often. We keep an eye on that with blood tests periodically. The triathlon community in Boulder is awesome and of course there’s always someone faster here, which makes it great. The convenience to the trails and roads for biking is fantastic as well. There are so many routes that you can ride whether it’s uphill, flat, rolling etc. We have a great mix of training that is available to us. For teams or individuals who don’t have friendly run and bike areas, they could travel to a training camp here in Boulder or other great options in the US (California and Arizona come to mind). Other options include having workouts with multiple bricks with teammates to keep it fun and safe. There is safety in numbers on the roads. TP: Not to make you toot your own horn, but at TrainingPeaks we believe that coaching is the one factor that will take an athlete’s performance to the next level. How would you describe your coaching philosophy, and what do you think you do differently than other collegiate coaches or just do best? Mike: My philosophy is pretty simple: I treat every athlete differently because they all have different backgrounds, strengths, weaknesses and come from different places mentally speaking. Many athletes are great physically, but lack confidence. Some athletes are very confident, but don’t have the physical ability to catch up to that confidence yet. What do I do differently? Lots of things. 1. I’m involved. I try to know what’s going on with each and every athlete on our team. 2. I make sure they understand the importance of rest. 3. I give them blocks of training throughout the year to improve their weaknesses. For example – the team plan may be in an LT block of training, but a few people may be doing a swim block or run block and only maintaining the other two sports at that time. 4. I’m not afraid to push them past what they think they can do on a weekly basis. Once a week they get a workout that might make them think twice about if they can get through it. What do I do best? I’m a good evaluator of talent and can help people reach goals beyond what even they think they can do. Example: Cedric Wane was 21st at Nationals the year before I coached him at CU. In the two years I coached him, he was 3rd and then 2nd at Nationals. For him it was all between the ears – he had the talent and not the confidence. Once I was able to convince him he could get there, it was easy for him. TP: What do you think or hope your athletes would say about you? Mike: I think they would say I hold everyone to the same expectations, whether it’s coming to practice or putting in their volunteer hours. In terms of coaching, I hope they would say I get them to surpass what even they think is possible. I love when they set a goal at the beginning of the year and I tell them they’ll blow past it, and they do. That’s fun for me! This is just as fun for me with my student-athletes as it is with my 1-on-1 adult athletes that I coach. TP: Any last pieces of advice for other collegiate teams who want to put themselves on the map? Mike: Easy one, finally! Get a coach. Log your workouts, check out your progress. Make the hard days hard, and the easy days easy. Don’t be afraid to push yourself, but at the same time, don’t be afraid to take rest days when you need it. Get some support from your family with fundraising for the team. Be a TEAM. Train together and be consistent with your training and team expectations. This is a great sport and what makes it even better at the collegiate level is training and racing with your friends. TrainingPeaks would like to thank Mike Ricci and the CU Triathlon Team for allowing us to share their data and their “recipe for success”. To learn more about Mike and his coaching group, visit D3multisport.com. 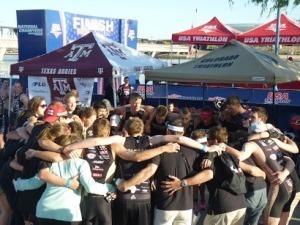 Also, check out our power analysis of some CU triathletes at this year’s USAT Nationals on usatriathlon.org.